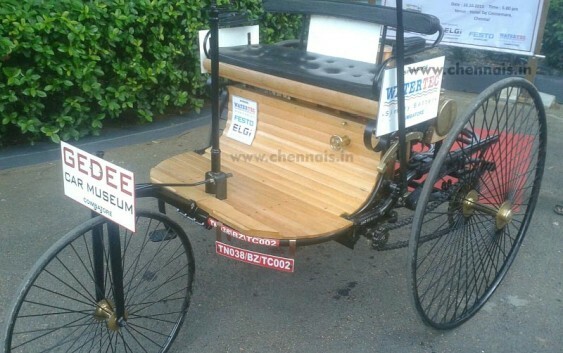 Chennai, 16.10.2015: The Historic 500 km non-stop journey by Replica of the World oldest Benz car was completed successfully. 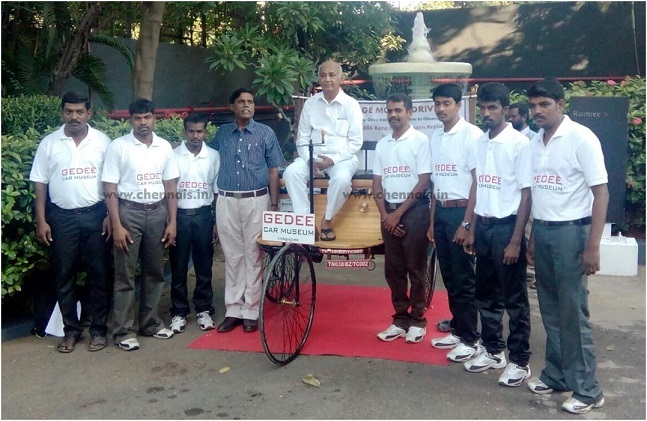 The replica of the 1886 Benz Motorwagen made by Gedee Car Museum started its extraordinary drive on 14th Oct, Wednesday evening from Coimbatore. An experienced panel of 6 drivers was involved to make sure the journey was completed safely and within time to reach Chennai. Mr. Har Sahay Meena, IAS, Commissioner of Tourism & MD, TTDC, Chennai and Mr. Achim Fabig, The Consul General, Federal Republic of Germany, Chennai welcomed the Vintage Car here in Chennai. The car was put to display to the public at Hotel Taj Connemara. The Historic 500 km non-stop journey by Replica of the World oldest Benz car was completed successfully. He further added, “Our students of Gedee Technical Training Institute were asked to make the drawings of the 430 parts and to make prototypes of the same, which was done in a very perfect manner. The manufacturing team had a big challenge because they had to work with the technology which was prevalent in late 1886. Many items had to be manufactured in the old way but this was a great achievement of the team in seven months and our first vehicle was ready.